The Aboitiz Group, through its social development arm Aboitiz Foundation and AboitizPower business unit Davao Light and Power Company, renewed its commitment to intensify conservation efforts for the marine turtle or pawikan, particularly the critically endangered hawksbill turtle in Davao City. 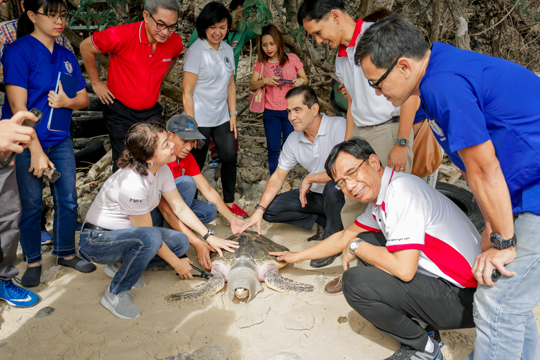 AboitizPower executive vice president Jim Aboitiz (center, kneeling) leads the release of a hawksbill turtle on the grounds of the Aboitiz Cleanergy Park. Aboitiz recently signed a Memorandum of Agreement with the Department of Environment and Natural Resources and Davao City local government to establish a Pawikan Center—a rescue and hatchery facility at the Aboitiz Cleanergy Park. “Davao is truly blessed to be a nesting site of marine turtles, which is a keystone specie in maintaining the balance in our ecosystem. It is clear that the government and the private sector must work together to protect these endangered animals before it becomes too late,” said Davao City Mayor Sara Duterte-Carpio. “We commend the Aboitiz Group, Davao Light and Power Co., and the Aboitiz Cleanergy Park,” she added, noting that over 3,000 pawikan hatchlings have been released from Cleanergy Park. With the signing, the Davao City government reiterated its commitment to the protection of various pawikan species. “We look forward to the creation of the Pawikan Rescue Center in Punta Dumalag, which will aim to protect the plant and animal life thriving in the marine eco park,” said Duterte-Carpio. “Thank you to Aboitiz. DENR is very blessed to have you. Truly, DENR Secretary Roy Cimatu will be grateful,” said Ruth Tawantawan, DENR assistant secretary for Eastern Mindanao. As part of this project, Aboitiz will also continue to plant endemic trees to maintain biodiversity in the area. “Today, after more than 13,000 mangrove seedlings planted and more than 3,000 hatchlings released, we renew our commitment,” said AboitizPower executive vice president and chief operating officer for distribution group Jim Aboitiz who led the conglomerate’s delegation to the MOA signing. Apart from protecting the nesting areas at the park, the Pawikan Center aims to identify, document, and address threats to marine turtles and their habitats in Punta Dumalag; promote research, monitoring, and information exchange; enhance public awareness on the conservation initiatives in the area; and fortify the collaboration between the public and private sectors for the long-term recovery of pawikan population in the area. The DENR will provide technical assistance, facilitate information and education campaign on marine turtle conservation, and establish Punta Dumalag as critical habitat for marine turtles, among others. Meanwhile, the Davao LGU, through local ordinance, will strengthen the enforcement of existing laws relevant to the conservation efforts, assist the DENR in the establishment of Punta Dumalag as a critical habitat for the marine turtles, provide manpower support for the project, and furnish DENR with monitoring reports.